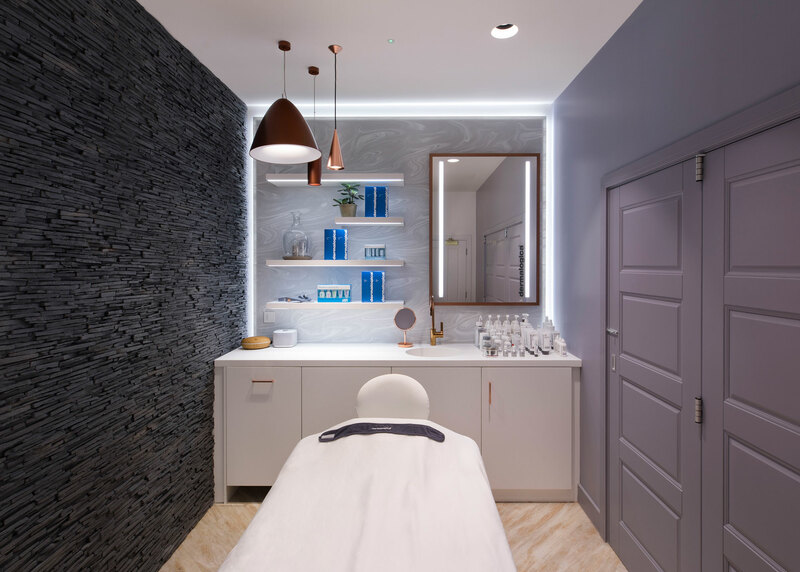 Highly valued for its sleek, hygienic finish, sophisticated colour palette and creative adaptability, Corian® has long been the preferred choice for beauty salons, aesthetic clinics and luxury retail environments. 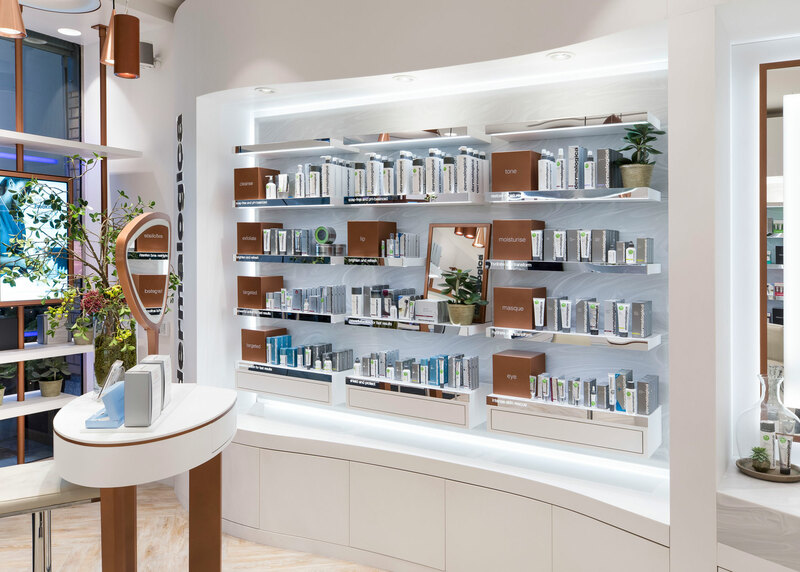 Corian® is also a favoured material of Limeblue Ltd, and thus the obvious choice of surface specification for long-standing client Dermalogica, and their new London flagship store. 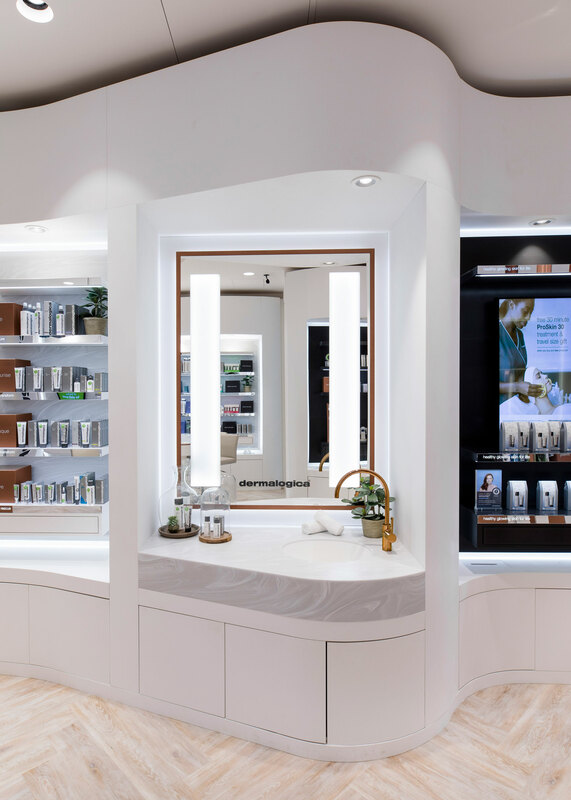 Corian® became a key solution to achieving this vision, forming the interactive skin bars in the fresh Glacier White colour choice – a pristine background to offset a series of copper-edged oval mirrors. Corian® in Glacier White, together with cool neutral shade Deep Titanium Grey, also marks out distinctive zones for the backlit product display shelves designed to entice customers into the inviting ambience of the store. Accent touches such as mirrored shelf fronts, plus copper blocks and pendants add to the sophisticated identity of the space, and the brand. A prominent white brick-effect wall leads customers downstairs to the opulent treatment rooms and VIP area, designed for a welcoming sense of wellbeing. Here, further Corian® shelving in Glacier White complements a feature wall in the swirling, exotic mineral effect of Corian® in Grey Onyx. The advantages of this elegant newer collection of colours for such applications are clear: all the beauty of natural stone with all the reliable performance of Corian®. Corian® in Glacier White (beauty bar tops, display shelves) and new Grey Onyx (back walls to the shelving systems and treatment rooms) in the new Dermalogica store by Limeblue Ltd.
Other striking elements of the store design include a textured ‘Panelstone’ slate-effect wall, from PanelPiedra, which features a prominent neon sign representing the image of a face to intrigue passers-by, plus wood-effect limewashed chevron flooring from Amtico and a unique lighting filter control system called ‘Beauty’ by Targetti which gives the skin a flattering and healthy glow. All photography courtesy of Limeblue Ltd. (www.limeblue.ltd.uk) All rights reserved, design and images. 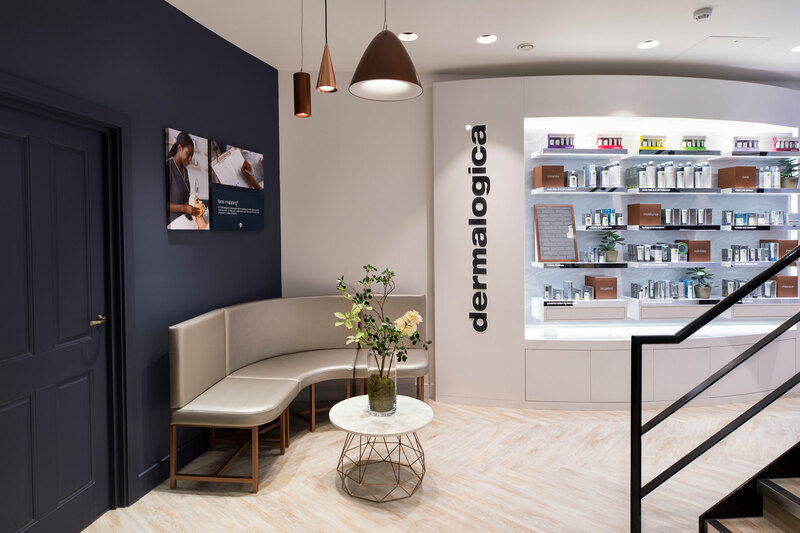 The Corian® installations at the Dermalogica London flagship store by Limeblue Ltd were fabricated by Corian® Industrial Partner, Principle.